“A Flicker in Eternity” is based on the writings and drawings of Stanley Hayami, which are archived at JANM. 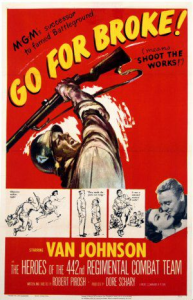 Original poster for “Go For Broke!” (1951). “A Flicker in Eternity” by Sharon Yamato, Ann Kaneko and Joanne Oppenheim will be screened twice on Saturday, June 1, at 2 and 3 p.m. This documentary tells the true story of Stanley Hayami, a talented teenager caught between his dreams of becoming an artist and his duty to his country. Based on his diary and letters archived at JANM, this coming-of-age tale chronicles Hayami’s life behind barbed wire and as a member of the 442nd Regimental Combat Team. The film captures this young man’s humor and imagination through endearing cartoons and witty observations that provide a first-hand look at the indignity of incarceration and the tragedy of war. Q&A with filmmaker and family to follow the 3 p.m. screening. Dawn Hayami, Stanley’s niece, will be a special guest. “Go For Broke!” will be screened on Sunday, June 2, at 12 and 2 p.m. Written and directed by Robert Pirosh and released by MGM in 1951, the movie tells the story of the 442nd RCT. The main character is Lt. Grayson (played by Van Johnson), who harbors prejudice against Japanese Americans when he is first assigned to the unit, but through a series of battles in Italy and Germany, comes to like and respect the Nisei. The cast, many of whom were actual 442nd veterans, includes Lane Nakano, George Miki, Akira Fukunaga, Ken K. Okamoto, Henry Oyasato, Harry Hamada and Henry Nakamura.